Using solar or wind power to produce carbon-based fuels, which are commonly called fossil fuels, might seem like a self-defeating approach to making a greener world. But when the starting material is carbon dioxide, which can be dragged out of the air, the approach is as green as it gets. The technology that makes it economically feasible isn't available yet, but a recently published paper presents nice step forward in the effort to not just sequester CO2, but turn it into a useful fuel that is part of a carbon-neutral future. Xiao-Dong Zhou, an associate professor of chemical engineering at the University of South Carolina, is part of a team that is working on a sustainable approach to harnessing renewable energy. Solar panels and wind turbines are most typically used to produce electricity, but on a large scale, electricity from sources like these pose problems. Utilities need to meet demand at all times, so if a power company is relying solely on wind or solar, what happens when the sun goes behind the clouds or the wind takes a breather? An alternative that has been long talked about is to use that green electricity to kick CO2 up the energy ladder. Carbon dioxide, the combustion by-product that comes out of power plant smokestacks and is getting too plentiful in the Earth's atmosphere, is at the bottom of the hill when it comes to carbon-based fuels. As energy goes, it's spent. If you could add some energy to it, though, you could convert CO2 into carbon compounds that are fuels, not a waste product. In chemical parlance, it's called reducing CO2 when you convert it to less-oxidized forms of carbon, all of which have actual fuel value. Some single-carbon molecules to aim for would include (in increasing energy content) carbon monoxide (CO), methanol, and methane. Any of these could be stored for a cloudy or windless stretch of time, and in most situations a lot more readily than electricity. Methane is the primary component of natural gas, for which there is already plenty of existing infrastructure. Methanol, or wood alcohol, is a close relative of ethanol, or grain alcohol, and is routinely used as a liquid fuel. Carbon monoxide might seem unusual in this context, but it has chemical value as a fuel, both in and of itself and as a precursor to other fuels. The trick, of course, is to be able to do the CO2 reduction economically. That means not just efficiently converting the electrical energy into chemical energy, but also making the device that does the job a cost-effective one. Zhou and his research team recently published a paper in Angewandte Chemie that shows progress on both fronts. They have developed potentially inexpensive catalysts that efficiently convert CO2 to CO in an electrochemical cell. As a starting point for making the catalysts, they used as a model carbon nanotubes, which are made purely of carbon atoms. But in making their catalysts for CO2 reduction, they departed from the carbon-only motif by sprinkling in a few nitrogen atoms to create a different kind of geometric and electronic structure. 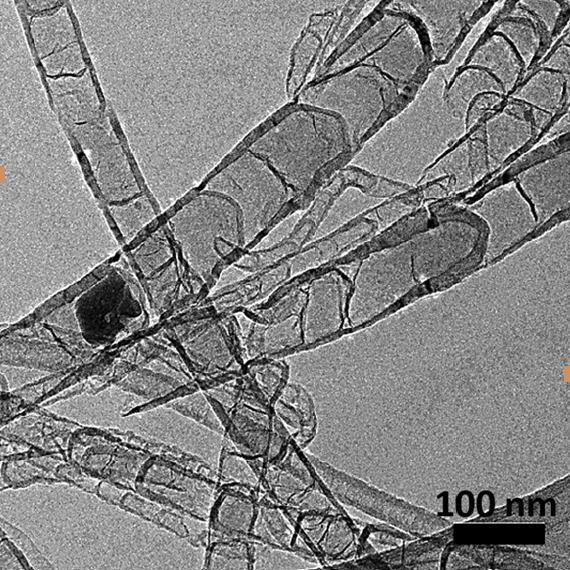 The resulting "nitrogen-doped carbon nanotubes" proved to be adept at reducing CO2 to CO, and the team reports that the catalysts are more stable than metal-based catalysts reported in the literature for the same reaction. What's more, the researchers went even further, defining how the microstructure on the nitrogen-doped carbon nanotubes can affect the catalysis. When a nitrogen atom is substituted into a position where a carbon atom belongs in a carbon nanotube, it turns out that several distinct chemical bonding patterns can result. The team showed that one of them, termed the pyridinic structure, was the most effective as an electrocatalyst, and was competitive even with much more expensive precious metal catalysts that have been reported for CO2 reduction. Zhou and his colleagues are pleased with their success so far, but the research team has their sights set even higher. "We are working in conjunction with other institutions, and they are developing the other side, the water side, using photovoltaics to split water, and eventually we want to couple those two reactions together," Zhou says. "So one side will be water splitting, generating protons from the anode that travel through the electrolyte to reach the cathode side and then react with carbon dioxide and with incoming electrons to convert carbon dioxide to fuels. Carbon monoxide is one kind of fuel you can produce, and methane and methanol are other fuels that can be produced. "There's still a long way to go, but it's a start."